My latest order is for a dear friend who wanted to welcome her new baby home in a custom made crochet hat. As soon as she messaged me on Facebook, I knew the Crochet Newborn Knot Hat by Repeat Crafter Me would be perfect! 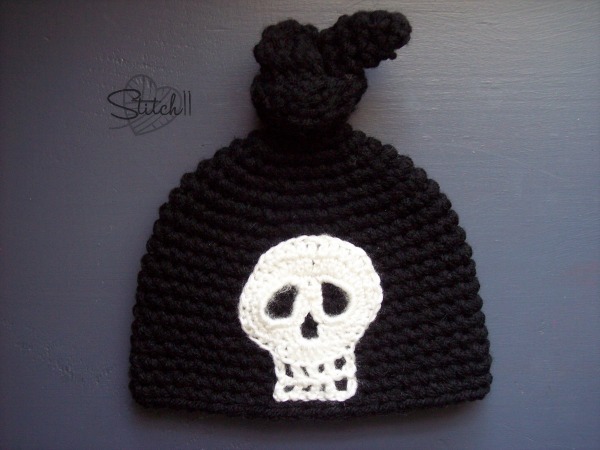 I told her I could put any applique on the hat that she wished.. and she requested a skull. Which is really ideal for their family since her daughters love Monster High! To make the skull I followed the Day Of The Dead Skull Applique by KristinsKrazyKnits. I found this free pattern through one of Moogly’s wonderful round ups that you can check out HERE! For the hat I used Red Heart With Love and for the skull I used Cascade Cherub DK weight. what a macob thing for a newborn. Skulls are a symbol of death, even in tarot cards it is a symbol of ipending death of something. Not very good for someone just starting lie. Not everything is about symbols for people. It is part of the human body. I may not have chosen it for a newborn myself, but it is not my place to judge anyone else for this choice.